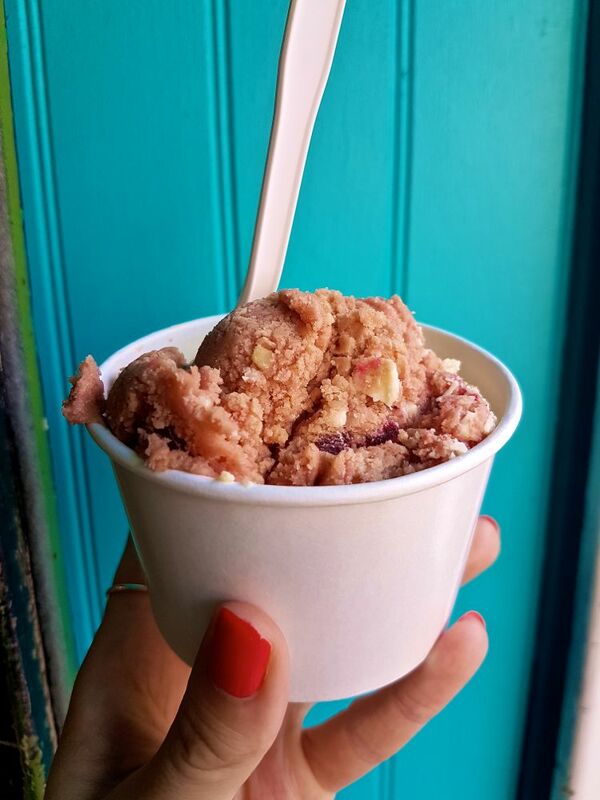 So summer’s about halfway over and I’m still working through writing about all of the tasty ice cream spots in the city. As you can see, this is taking me years. Too many ice cream shops to keep track of is a good problem to have, if you ask me! 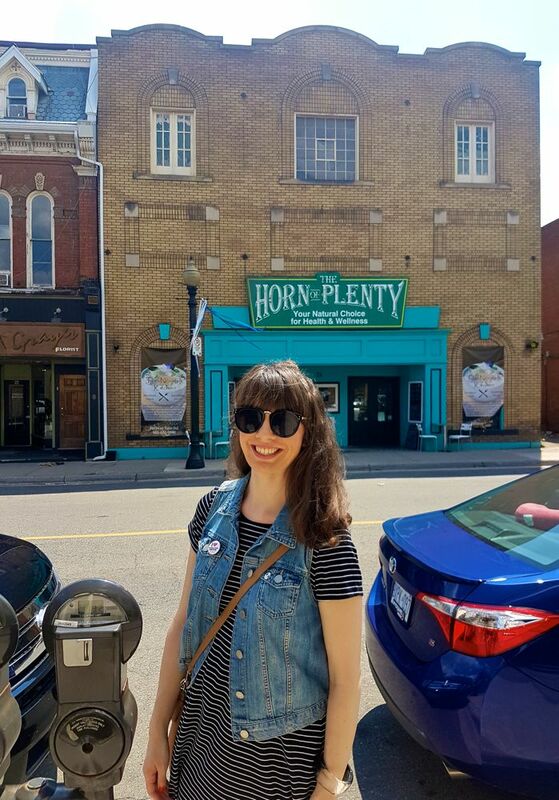 Next up – The Horn Of Plenty in lovely downtown Dundas. At first glance, this may look like a cute little corner store. 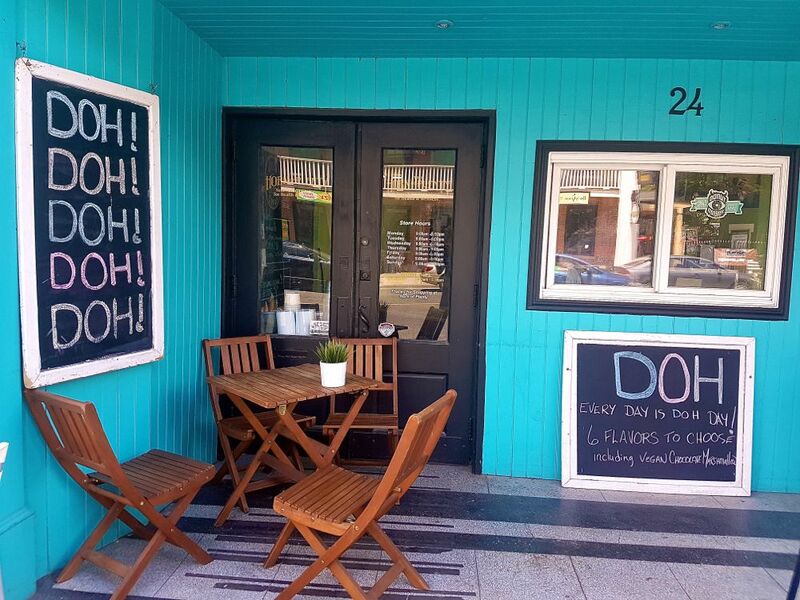 A delicious and nutritious health food store, at that, but they also serve ice cream, along with their secret weapon – DOH! More on that in a minute, though. The Horn Of Plenty opened in 1980 by Neil and Denise Gloster and they sold only healthy bulk foods at that time. 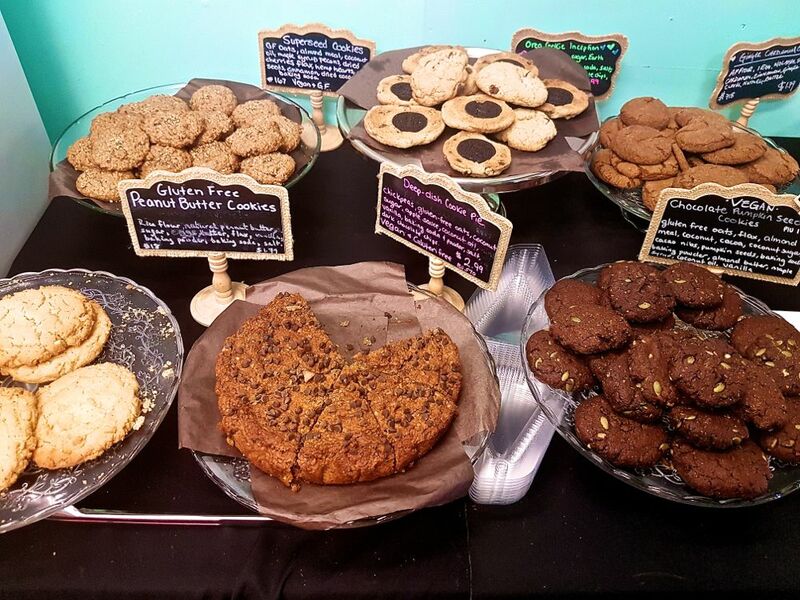 As the business grew and their customer base began asking for a variety of more health foods and products, they chose to expand to a bigger spot – an old theatre across the street. The store expanded into carrying nutritional supplements, natural grocery products, natural health and beauty products, environmentally friendly products and plenty of bulk foods. Neil and Denise retired in 2005 and their son Jason, who grew up working in the shop, then purchased the space. In recent years The Horn Of Plenty evolved with the times and now offers The Nourish Cafe, Inside Scoop Ice Cream Shop and their DOH! cookie dough brand. It’s now more of a gourmet food store, still with healthy and delicious alternatives. I wasn’t expecting the size of a full-fledged grocery store – there are rows and rows of products to peruse, scrumptious looking baked goods, and a small seating area to grab some lunch. On this day I was there for the ice cream! Thanks to their mouth-watering Instagram feed I had to add them to my list. Horn Of Plenty serves ice cream, milkshakes, and frozen treats like ice cream cookie sandwiches and root beer floats. As much as I love your standard ice cream, it’s always fun to see when a shop offers something a little different. Enter the DOH! If you’re like me and can’t resist snacking on a spoonful of homemade batter as you bake cookies, you already know you’re going to love this. Horn Of Plenty invented their own dough recipe and you can get it by the cup or by the cone, or even in containers to go. I knew I had to try the DOH! but I also knew I wanted ice cream. They anticipated this dilemma, and offer a 50/50 deal – half ice cream, half DOH! Carefully deciding which flavours may pair well together, I went with a white chocolate and cherry DOH! flavour they created for Canada 150, and salted caramel ice cream. I loved the delicious, doughy texture of the DOH! but I also craved that cold, melty ice cream, so it was a perfect match. When you post a picture, be sure to use their playful hashtag, #TASTESFRICKINAWESOME! I shopped at the Horn of Plenty from the time it opened until I moved away in 1987. I am glad to see it is still going strong. 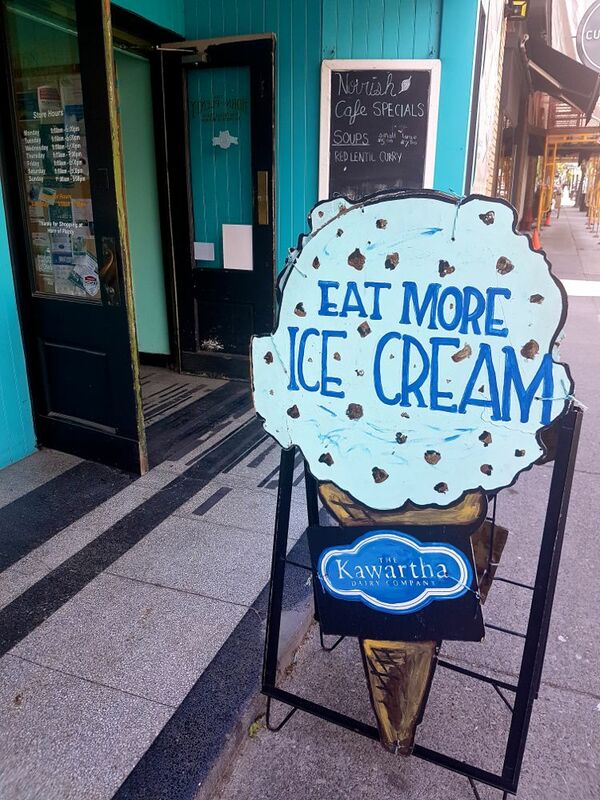 A great Dundas destination.